Who saw Christ with a rent tunic. 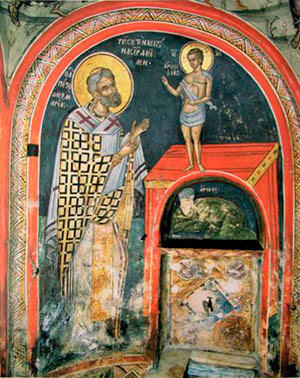 The Holy Hieromartyr Peter, Archbishop of Alexandria, was born and raised at Alexandria. He was a highly educated man, and was head of the School of Alexandria. In the year 300 he became the Archbishop of the Alexandrian Church, succeeding his teacher and spiritual guide, the holy Archbishop Theonas. Forced into exile from the city during the persecutions against Christians under the emperors Diocletian and Maximian, Peter traveled through many lands, encouraging his flock by letter. Again he returned to his city, in order to guide the Alexandrian Church personally during this dangerous period. The Saint secretly visited Christians locked up in prison, encouraging them to be steadfast in faith, assisting the widows and orphans, preaching the word of God, and constantly praying and officiating at the divine services. And the Lord kept him safe from the hands of the persecutors. During this time of unrest the iniquitous heretic Arius, who denied the divinity of Jesus Christ, sowed the tares of his impious teaching. When Arius refused to be corrected and submit to the truth, Peter anathematized the heretic and excommunicated him from the Church. Under the wise nurturing of Archbishop Peter the Church of Alexandria strengthened and grew in spite of the persecutions. During his time, six hundred and seventy Christians suffered in Alexandria; often, whole families were led to the scaffold and perished. Finally, on orders from the emperor Maximian (305-311), the Saint was arrested and sentenced to death. A multitude of people gathered at the entrance of the prison, expressing their outrage. Wanting to avoid bloodshed and a riot by the people, the Saint sent a message to the authorities, in which he suggested that they make an opening in the back wall of the prison, so that he might be taken away secretly to execution. 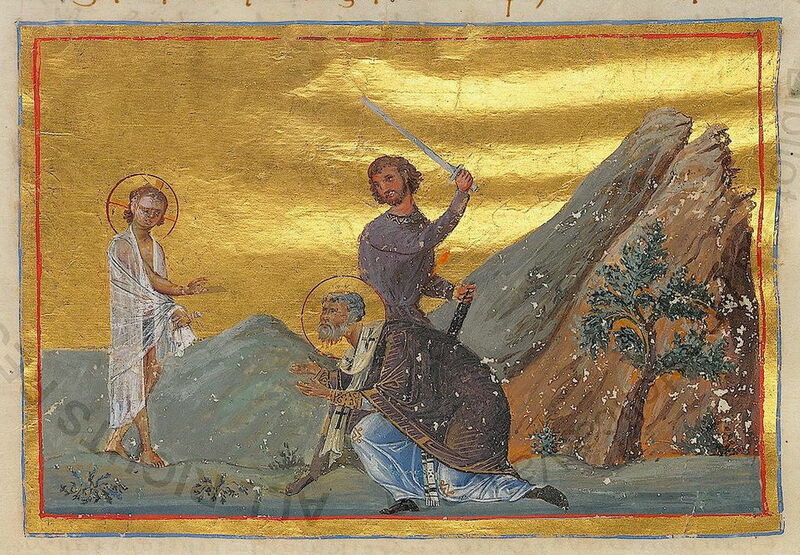 In the dark of the night Peter went with the executioners, who took him beyond the city walls and beheaded him at the same spot where formerly the Holy Apostle Mark had been executed. That night a certain pious virgin heard a voice from heaven saying, “Peter was first among the Apostles; Peter is the last of the Alexandrian Martyrs.” This took place in the year 311. In the morning, when people learned of the death of their Archbishop, a crowd gathered at the place of execution. They took up the body and head of the Martyr and went to the church, and dressing him in his hierarchical vestments, they sat him on his throne at the high place in the altar. It said of Saint Peter that he never climbed the steps and sat on the patriarchal throne in church but rather stood or sat before the steps of the throne. When the faithful began to complain why their hierarch does not sit in his place, he replied: "Whenever I approach the throne, I see a heavenly light and power upon it, that is why I do not dare climb and sit on it." There is mention of a yet more glorious vision in his life. While Peter sat in prison, the ungodly heretic Arius hypocritically pretended as though he was repenting of his heresy and sent word through two priests to the captive Peter that he is renouncing his heresy with an appeal that Peter receive him into the Church again. Arius did this solely because he thought that Peter would be killed and that he would seize the patriarchal throne, from which he could, afterward, spread and strengthen his heresy. Before he gave him any kind of reply, Peter prayed to God in the prison. During prayer, an unusual light illumined the prison and the Lord Jesus appeared to him as a twelve-year-old boy, shining more brightly than the sun so that it was not possible to gaze upon Him. The Lord was clothed in a white tunic, which was rent down the front, from top to bottom. The Lord was clutching the garment around Himself, with His hands as though to hide His nakedness. Seeing this, Peter was in great fear and horror and cried out: "Who, O Savior, has torn Your garment?" The Lord replied: "The madman Arius. He tore it, for he alienated My people from Me whom I acquired by My blood, but be careful not to receive him in communion with the Church for he has cunning and diabolical thoughts against Me and My people." Hearing this, Saint Peter replied to his priests, Achilles and Alexander, that he cannot receive Arius' petition for it is false and cunning and the Saint pronounced a curse on Arius in both this life and the next. He also prophesied that, first Achilles and, after that, Alexander would follow him as patriarch and, so it was. 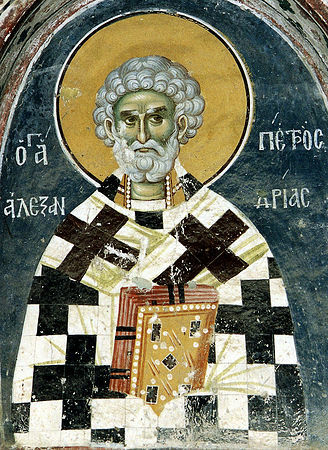 Saint Peter, a great champion of Orthodoxy, is known also as a profound theologian. Passages from his book, “On the Divinity (of Jesus Christ)”, were consulted at the Synods of Ephesus and Chalcedon. Of all his works, the most widely known and highly esteemed by the Church are his “Penitential Canons”. You were shown forth as trumpeters of divine knowledge, and revealers of the ordinances of the faith, Clement thou fruitful vine of life, and Peter firm rock of the faithful. Since you are seers of ineffable mysteries deliver us from every harm. Unshakable divine towers of the Church, God-inspired and mighty pillars of piety: we praise you, Clement and Peter, guard us all by your intercessions. You made bright the Church, by your Orthodox doctrines, and contested on its behalf, Peter blessed of God, you banished the apostate Arius, wherefore we celebrate your all-holy memory, crying out to you as Orthodox: Rejoice O Peter, the rock of faith.